Welcome to the Alumnae Page! I will like to introduce the new Alumnae Board as of April 1, 2016. We hope to continue in the efforts of the previous board to connect all alumnae around the world and continue to communicate, share experiences, thoughts, and views via email, Facebook, webpage, and reunions! We understand the challenges for women through every stage of life after high school but hope you will find the time to join and participate in the wonderful sisterhood of ISSH and the Sacred Heart Community worldwide. On February 18th, 2012, a life-sized statue of St. Madeleine Sophie Barat was commissioned with funding from donations and merchandise sales from the past years. Located in Sophie’s Garden near the breezeway, the statue stands below a canopy of cherry blossoms in spring. Sophie's Garden is a memorial to our school’s founder and to alumnae who passed away at a young age. Their classmates have donated four dogwood trees to plant around the school. Unfortunately construction work for the new building affected some of the trees. We are in the process of replanting the trees in new locations with identical placards explaining their significance. In order to have landscaping done and maintain the garden area and the trees, we need to ask for your continuous donations. The garden will cost approximately 300,000 yen. Last year, we raised 50,000 yen through a movie night and another 50,000 yen from free dress days. 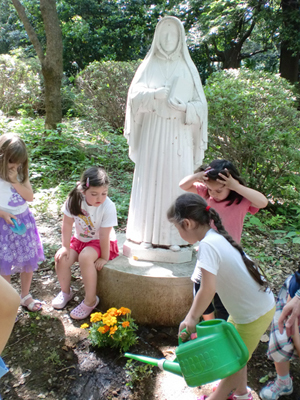 We still need to raise 200,000 yen.Some classes have assisted in planting flowers and plants in the garden, however we do need to maintain this throughout the years to come. We would appreciate your kind donation for this purpose. We are proud of our Alumnae and look forward to hearing from them!